Don't let your first grade graduate's knowledge dry up over summer break! Prevent summer learning loss in just 15 minutes a day. 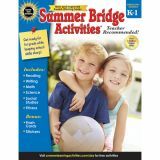 Perfect for at home or on-the-go, Summer Bridge Activities®: Bridging Grades 1-2 keeps kids busy with interesting learning activities all summer long! Give your soon-to-be second grader a head start on their upcoming school year with Summer Bridge Activities: Bridging Grades 1-2. With daily, 15-minute exercises kids can review two-digit place value and verb tenses and learn new skills like measurement and compound words. This workbook series prevents summer learning loss and paves the way to a successful new school year. 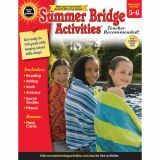 And this is no average workbook—Summer Bridge Activities keeps the fun and the sun in summer break! Designed to prevent a summer learning gap and keep kids mentally and physically active, the hands-on exercises can be done anywhere. These standards-based activities help kids set goals, develop character, practice fitness, and explore the outdoors. With 12 weeks of creative learning, Summer Bridge Activities keeps skills sharp all summer long! Don't let your second grade graduate's knowledge dry up over summer break! Prevent summer learning loss in just 15 minutes a day. 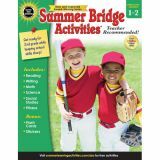 Perfect for at home or on-the-go, Summer Bridge Activities®: Bridging Grades 2-3 keeps kids busy with interesting learning activities all summer long! Give your soon-to-be third grader a head start on their upcoming school year with Summer Bridge Activities: Bridging Grades 2-3. With daily, 15-minute exercises kids can review skip-counting and using adjectives and learn new skills like rounding numbers and writing compound sentences. This workbook series prevents summer learning loss and paves the way to a successful new school year. Don't let your third grade graduate's knowledge dry up over summer break! Prevent summer learning loss in just 15 minutes a day. 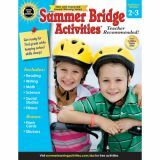 Perfect for at home or on-the-go, Summer Bridge Activities®: Bridging Grades 3-4 keeps kids busy with interesting learning activities all summer long! Give your soon-to-be fourth grader a head start on their upcoming school year with Summer Bridge Activities: Bridging Grades 3-4. With daily, 15-minute exercises kids can review calculating area and using quotation marks and learn new skills like fractions, similes, and metaphors. This workbook series prevents summer learning loss and paves the way to a successful new school year. Don't let your fourth grade graduate's knowledge dry up over summer break! Prevent summer learning loss in just 15 minutes a day. 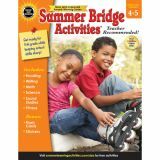 Perfect for at home or on-the-go, Summer Bridge Activities®: Bridging Grades 4-5 keeps kids busy with interesting learning activities all summer long! Give your soon-to-be fifth grader a head start on their upcoming school year with Summer Bridge Activities: Bridging Grades 4-5. With daily, 15-minute exercises kids can review fractions and prepositional phrases and learn new skills like finding volume and understanding homographs. This workbook series prevents summer learning loss and paves the way to a successful new school year. Don't let your fifth grade graduate's knowledge dry up over summer break! Prevent summer learning loss in just 15 minutes a day. 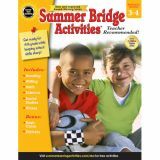 Perfect for at home or on-the-go, Summer Bridge Activities®: Bridging Grades 5-6 keeps kids busy with interesting learning activities all summer long! Give your soon-to-be sixth grader a head start on their upcoming school year with Summer Bridge Activities: Bridging Grades 5-6. With daily, 15-minute exercises kids can review decimals and using commas and learn new skills like ratios and word connotations. This workbook series prevents summer learning loss and paves the way to a successful new school year. Don't let your sixth grade graduate's knowledge dry up over summer break! Prevent summer learning loss in just 15 minutes a day. 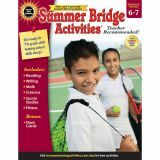 Perfect for at home or on-the-go, Summer Bridge Activities®: Bridging Grades 6-7 keeps kids busy with interesting learning activities all summer long! Give your soon-to-be seventh grader a head start on their upcoming school year with Summer Bridge Activities: Bridging Grades 6-7. With daily, 15-minute exercises kids can review dividing fractions and using parentheses and learn new skills like probability and word analogies. This workbook series prevents summer learning loss and paves the way to a successful new school year. Don't let your seventh grade graduate's knowledge dry up over summer break! Prevent summer learning loss in just 15 minutes a day. 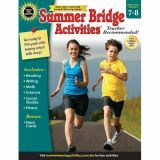 Perfect for at home or on-the-go, Summer Bridge Activities®: Bridging Grades 7-8 keeps kids busy with interesting learning activities all summer long! Give your soon-to-be eighth grader a head start on their upcoming school year with Summer Bridge Activities: Bridging Grades 7-8. With daily, 15-minute exercises kids can review proportions and misplaced modifiers and learn new skills like square roots and writing in the active voice. This workbook series prevents summer learning loss and paves the way to a successful new school year. Don't let your kindergarten graduate's knowledge dry up over summer break! Prevent summer learning loss in just 15 minutes a day. 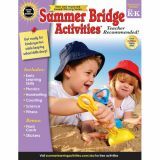 Perfect for at home or on-the-go, Summer Bridge Activities®: Bridging Grades K-1 keeps kids busy with interesting learning activities all summer long! Give your soon-to-be first grader a head start on their upcoming school year with Summer Bridge Activities: Bridging Grades K-1. With daily, 15-minute exercises kids can review rhyming and counting and learn new skills like telling time and writing complete sentences. This workbook series prevents summer learning loss and paves the way to a successful new school year. Don't let your preschool child's knowledge dry up over summer break! Prevent summer learning loss in just 15 minutes a day. Perfect for at home or on-the-go, Summer Bridge Activities®: Bridging Grades PreK-K keeps kids busy with interesting learning activities all summer long! Give your soon-to-be kindergartener a head start on their upcoming school year with Summer Bridge Activities: Bridging Grades PreK-K. With daily, 15-minute exercises kids can review colors, shapes, and letters and learn new skills like addition, subtraction, and vowel sounds. This workbook series prevents summer learning loss and paves the way to a successful new school year.